IDC is tipping annual growth of 2.8 percent in the New Zealand IT services market over the next five years, and says IT services providers will need differentiate themselves to secure a share of this growth as cloud services become increasingly commoditised. IDC says IT services vendors and their partners will play a large part in the growth of the IT services market by helping organisations implement and manage cloud solutions. "The challenge for IT services providers will be to differentiate themselves from competing vendors as cloud services become increasingly commoditised," IDC says. "As a result, the ability to communicate their capabilities across complex digital ecosystems and to partner effectively will become even more critical." The predictions come from IDC's recently published "New Zealand IT Services Forecast and Analysis, 2018-2023" report. It updates IDC's previous forecast for the five years to 2022, which predicted growth of 2.7 percent CAGR. 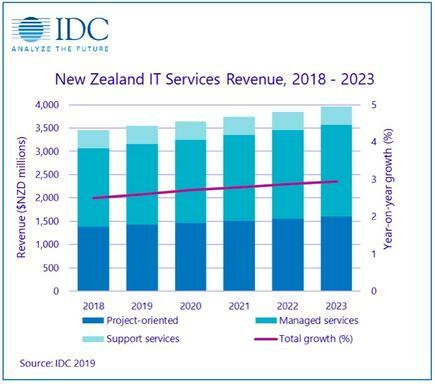 IDC says the New Zealand IT services revenue will be worth approximately $3,960 million in 2023, up from an estimated $3,452 million in 2018, with the managed services market showing the highest CAGR through to 2023. "A driver of this accelerated growth is that organisations are shifting from cloud for business and system optimisation to using the technology to create competitive advantages and in conjunction with other innovation accelerators, such as IoT and AI," IDC says. IDC's ANZ market analyst for IT services, Chayse Gorton, said organisations were moving beyond questioning whether they should migrate to the cloud to instead analysing the impact of not migrating to the cloud. "They are instead analysing… how they can use cloud to create competitive differentiation by shifting digital talent from traditional in-house IT to innovation initiatives," he said.